Droidscape: Basilica is one of the most interesting games I've come across in a very long time, breaking ground with some truly unique ideas and gameplay twists. 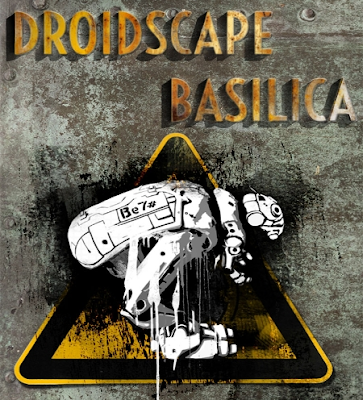 The folks at Kyttaro Games have dubbed Droidscape: Basilica as a 'sci-fi, stop motion animated action puzzler' and I couldn't have described it better myself. Let's start with sci-fi. Droidscape takes place in a pretty dark-sounding universe in the year 4057(! ), a time when humanity has been plunged into a second Dark Age. Apparently, one of the last remaining 'Chronomancers', who must be responsible for saving said humanity in some capacity, has been taken hostage on the Basilica space station. Of course, as is usually the case in these situations, only a lowly little droid named Bishop 7 can save him. This adorable little bipedal android is controlled by none other than you, the player. He, in addition to all the characters in the game, was hand-created in clay and brought to life with stop-motion. I have a deeply rooted love of stop-motion animation, fueled by childhood evenings huddled around the measly tube TV watching Sinbad and the Eye of the Tiger with my father. Thus, the graphic presentation of Droidscape charmed me immediately. Characters and enemy androids really pop on the screen with colour, personality, and life. All of this is accentuated by ace, satisfying sound effects and an atmospheric soundtrack - when played with headphones as the game recommends, you won't be disappointed. Gameplay in Droidscape: Basilica is equally unique, sort of a hybrid of line-drawing and action puzzler that's challenging to grasp at first, but clicks soon enough. Players are presented with the stage at hand, varied systems of levels filled with killer robots, keys and their corresponding locked doors, traps, and so forth. Some enemies follow pre-determined paths, some have other behaviors - these paths are usually indicated with an arrow showing their direction of movement. Bishop 7 must make it to the exit of each level unscathed using only a limited supply of energy. To do this, players must first draw a line which will represent the path Bishop 7 will travel through the level. 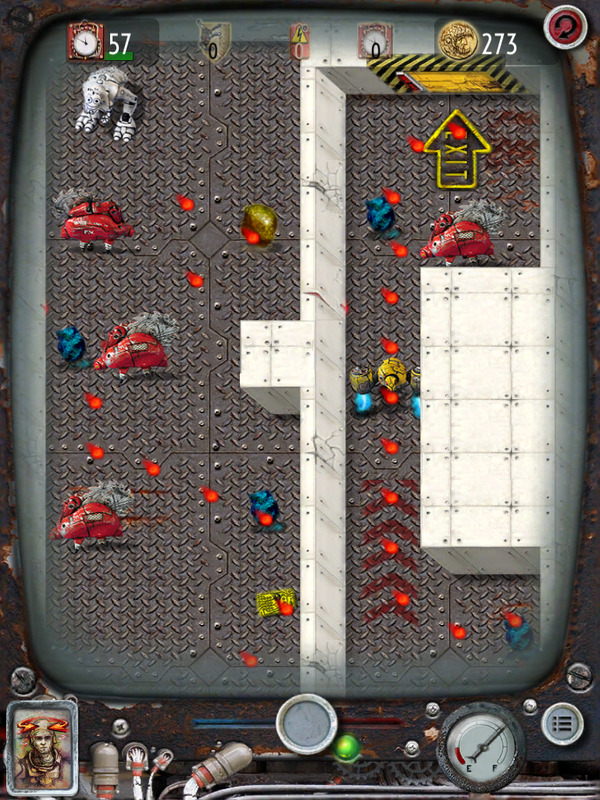 Once this is complete, the live gameplay begins, during which the loveable 'bot can be controlled much like a train with an analog forward/back control. Now, the player must utilize precise timing to guide Bishop 7 through the level and past the obstacles. The game even includes a pretty novel 'head-tracking' feature, in which players can use the front-facing camera to twist their head to the left or right to advance him, effectively allowing hands-free gameplay during the action phase. With this, I found some satisfaction in a game that, while beautiful, didn't grab me much at first. There's a sense of pride in completing a level by just a hair; advancing to the exit on the first line path drawn - and an equal sense of dread as your cute little buddy plows straight into a pig android with a buzzsaw on his back due to a failed path design. 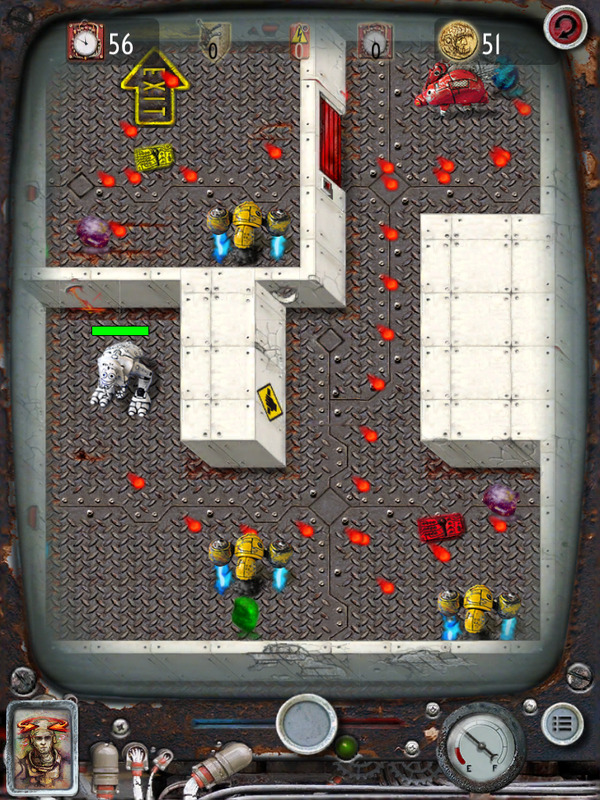 Memories of old games from the 90's like 'The Incredible Machine' came flowing back; Droidscape has an almost educational vibe to it, being that players create a plan, set in motion, then return and fix if it fails. If I had kids, I'd encourage them to play this game merely for the skills it can teach such as memory, reflex, and problem solving. However, Droidscape: Basilica is not without its faults, some of them aggravating - such as the over zealous collision detection that renders it difficult to discern whether Bishop 7 will impact with an enemy or not at times. This isn't a big deal on earlier levels but gets much worse on larger levels where you KNOW a path you drew was well-made and should work, only to barely brush an enemy and meet your demise. In addition, the head-tracking feature, while cool and innovative, wasn't very useful for precision gameplay and I vastly preferred the analog control. 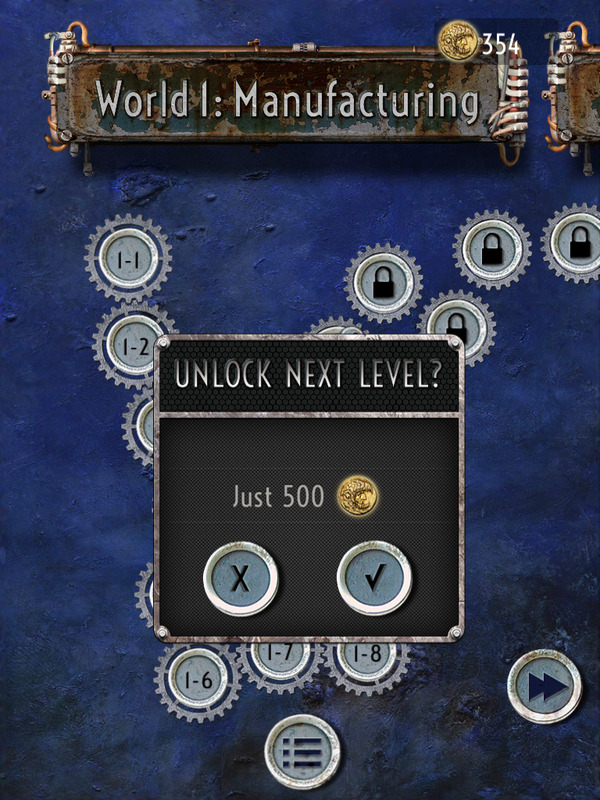 Finally, I did find the pop-ups encouraging the use of 'coins' to advance through levels or purchase power-ups somewhat annoying, given that this is a paid game. Coins can be earned through regular gameplay, too, meaning IAP is optional, which is a good thing. Despite its flaws, I found myself enjoying Droidscape for what it is: a well-made, gorgeous, interesting puzzler that I hope garners at least a cult following among fans of the genre. There's also a ton of content here with 60 levels that become taxing quite quickly among several varied environments. For $1.99, it's a must have for those who like games that tickle your puzzle bone. Purchase the iOS version here (from the iOS App Store). I have to agree with Peter here - Droidscape is an amazing looking game based on an ingenious game mechanic. However, on the negative side there is a fine line between innovation and gimmick, and I'm sad to say that the head-moving control option is definitely the latter case. Although it does work, it's kind of counter-intuitive to have to turn your head away from the screen/camera in order to adjust speed - after all, this is a video game - and generally speaking, in video games you kind of have to be able to see what you are doing. Turning your head away from the action isn't exactly helpful in that regard, but at least Kyttaro Games made the effort to bring something new to the table. In conclusion, a smaller hitbox would have helped make the game feel a little more forgiving (especially when playing on devices with smaller screens), but overall I'd agree that it's a decent little game that is well worth the asking price. Wrong App-Store Link (to Retro Racing)!